A wine tasting is an event at which wine lovers taste and compare a number of wines. The event could be conducted like a class or a seminar, where the participants are seated at desks or tables, or it could be held in a party-like atmosphere where the tasters mill around informally. The setting for the wine tasting should be conducive to the event. Tasters must be able to concentrate as they compare different types of wine, so quiet conditions are preferable to noisy ones. 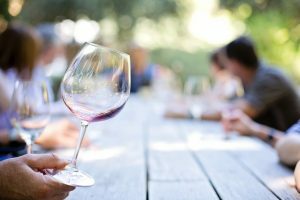 Proper wine glasses should be on hand to allow the tasters to fully enjoy the wines’ aromas and flavors. Taste – Your taste buds will help you savor the wine in your mouth, but the experience should continue after you swallow. You should be able to note subtle changes in the aroma of the wine even after it has left your mouth. Notice the sourness, sweetness, and bitterness of the wine in varying degrees. Appearance – Note the color, opacity, and viscosity of the wine. You can tell a lot about a wine just by looking at it. Scent – When you smell a wine, you should be looking for its primary aromas. You’ll be able to detect grapes right off the bat, but you may also be able to detect other fruit, herb, and floral notes. Staying power – The taste of the wine is time-based. There is the beginning, middle, and end taste, each of which is distinct. The taste can linger on your tongue long after you have swallowed it. Some remain longer than others. Texture – There is greater texture in higher-alcohol wines. You can also detect the tannins in the wine. In red wines, the tannins may create a sensation that feels rough and dry to your taste buds. If you walk into a wine shop, the choices can be overwhelming. Wine tastings allow you to narrow down the possibilities based on your preferences. Some wines may turn you off, others may simply fade into the background, but you’ll likely find a few that leave you longing for more.